An estimated 11 million Syrians have fled their homes since the outbreak of the war in 2011, taking refuge in neighboring countries or within Syria itself. According to the United Nations High Commissioner for Refugees (UNHCR), over 3.5 million have fled to Syria’s immediate neighbors Turkey, Lebanon, Jordan, and Iraq. 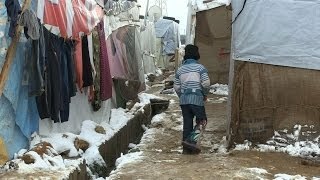 These videos reflect the suffering the Syrian people are going through, and the great work American Relief Fund ( ARF ) is doing to alleviate some of that suffering.